Your Local Yokels are staring in disbelief at our televisions again this morning, for what seems like infinite mornings at this point. Every once in awhile some dolt’s irresponsible shrieking about “Rain Tax” worms it’s way into our consciousness and turns into a rage supernova. Just as it did a moment ago, when CNN showed an arial view from the 1950’s of the Addicks Reservoir west of Houston. This is a picture of the dry reservoir that normally serves as a park, with vast farmland property to the northwest of that. Then they showed a photo of today, where hundereds of thousands of closely packed homes and the network of roads and driveways and patios create an impermeable surface nightmare that overwhelms the flood control system. This is clearly a catastrophe of historic proportions, but the situation is not helped by the lack of policy and regulation, and conditions that coddle developers over residents. Things that Houston and Texas both are famous for. This is what happens when you have irresponsible, unchecked development and ignorance of the mitigating solutions. 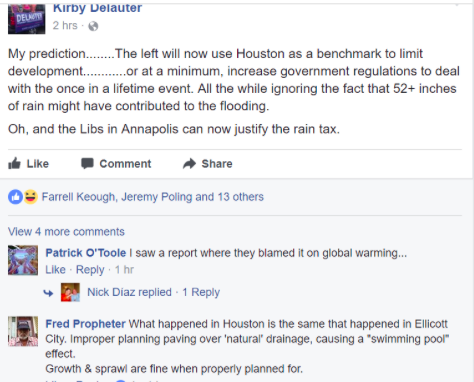 For now, the solution is to produce controlled flooding of properties downstream (including the downtown area) in the hopes that the levees there and at a second reservoir under similar strain do not catastrophically fail all at once, and create a much more destructive and dangerous condition. This situation is not nearly over. In our region we typically deal with inconvenient storms that you can plow and shovel and move and sometimes relocate and dump and melt. Here we see a virtually flat city inundated, and people have been lost to both rising and rushing waters that are far more difficult to control. Due to our landscape, flood waters can also come at us rushing downhill. The fact that anyone around here ever behaved as though this is a strain on developers ignores the strain on life and property for potential victims. Let this be an ongoing lesson to those who may want to turn on the television and reexamine their priorities. The average annual rainfall in most of Maryland is only a few inches different from the norm for the Texas Gulf Coast. In the meantime, do what you can to help Texas and now Louisiana, as Harvey continues to hammer them. LOLOLOLOLOLOLLLLLLLL look what we found before we published! You fool. It’s used to justify it because the facts check out. Your pal Fred Propheter is correct–proper planning (including funding mitigating drainage systems to handle the water) is necessary. You have to pay for that somehow! Now we get to tag Kirby Delauter and the CE race in this. Well played, social media treasure trove! 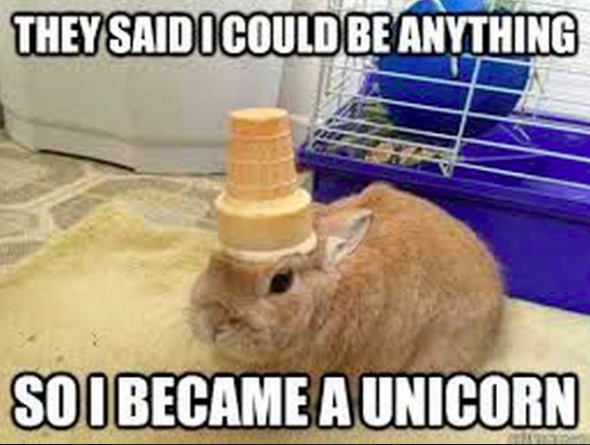 You be you! The layers of this onion are as swollen and pregnant as John Donne’s flea. What meanest thou, dim hashtag? It could be argued that this writer believes in deriding the elites of the tech world, in spite of the irony that those individuals make so many of the dollars that help keep the economy from sucking like a flea. A descendant theory holds that it is mere ambivalence to the U.S. stock market and its investors. Whatever the intent, this collection of loaded imagery calls the reader to remember the author’s relationship to the ironic tension created through his advocacy of the tech free Jefferson Tech Park. 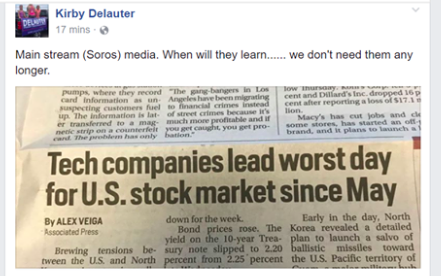 The prevailing scholars at present concur that Delauter is implying #fakenews, and the statement “we don’t need them any longer,” must be interpreted as an insistence that the only news others should read is the propaganda disseminated via Facebook videos Trump’s minions produce, the Increasingly Nuclear Twitter War Tweets of POTUS himself, and retweets from members of his “intellectual” coterie. One notable local member is Councilman Billy Shreve. This is a device one will see frequently employed within the wing nut genre: by employing a heavily loaded allusion, such as the one to Soros, his reader is immediately aware of the team he plays for. It is critical for the writer convey that he is not on the team of reason and science and engineering and physics, dear readers. His allegiance is to #teamcovfefe, also referred to in texts as A Basket of Gullibles. As to which interpretation is the writer’s intended one, readers may also determine that the answer is most like Sarah Palin’s news sources: all of them, Katie! You guys. Kirby has a T-shirt ostensibly intended to allow firefighters to show support for his campaign, and we cannot wait for you see it! 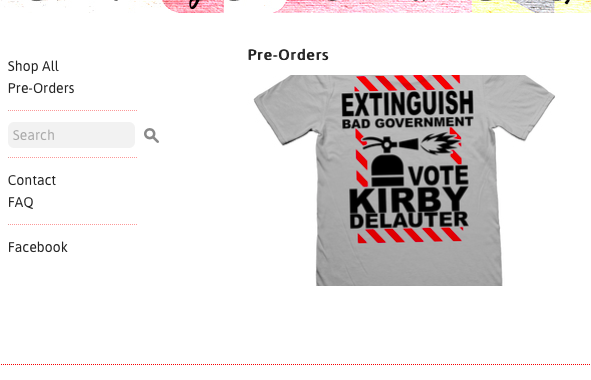 It says, “Extinguish bad government/Vote Kirby Delauter” and depicts a flame throwing fire extinguisher…um…torching everything in sight. Now, we are not professional fire fighters, but we are pretty sure that isn’t how you put out fires. Doesn’t it have a blowtorch effect? 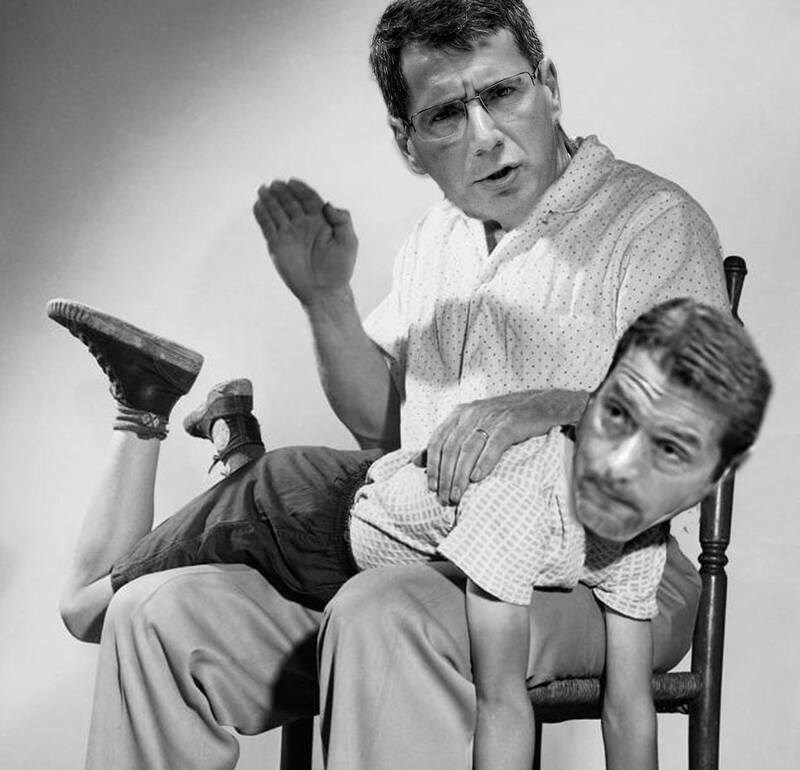 My oh my, this is too much fun. It gives that flow chart a run for its money on giggle fit potential. It is poignant, y’all. What a master of symbolism. We had no idea of the fertile artistic mind operating behind that basic dude/common clay image. Accidental brilliance. What could better represent the unintended consequences that would result from voting for this dingdong. Way to fan the flames, man! Another fun thing we’ve noticed is that he is taking pictures of random individuals. Individuals. Then he tags them with some category. Say Kirby bumps into Joe the Plumber at the carnival, right? 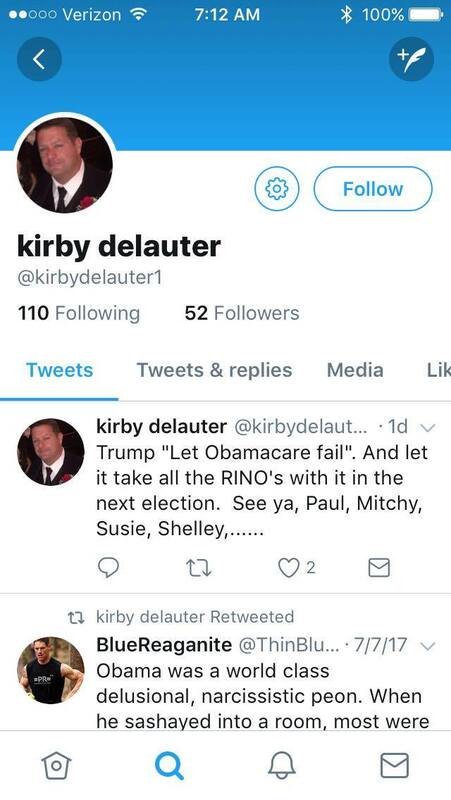 And Joe, who you may have heard is a plumber, is apparently feeling kindly toward Kirby, who <<waves wand, a la peanut butter and jelly sandwiches>> becomes a movement like Plumbers for Kirby. So much for his English degree. That’s not how singular and plural work, but better luck next time. May this campaign never end. It is such a delightful diversion from our national nightmare. However, we do notice that Women for Kirby has 117 likes, and like Hair Furor’s approval rating, that is too many. Don’t get carried away here, people.